Moken is probably the oldest group, and they originated from southern China some 4000 years ago. They are living on the west coast of Burma and Thailand, they have their own language, their own religion and have historically made a living completely from hunting and gathering – both in sea and on the coastlines. Today they are trading in order to get rise and other necessities. Moken received international attention after the tsunami in Southeast Asia in 2004, when no Moken died even if they where living in exposed areas. They had tales warning of tsunamis and what to pay attention to at sea. Many elderly Moken had also themselves experienced minor tsunamis. In the early 2000’s Anna Gislén studied Moken children’s underwater vision in Thailand, after tip from Professor Erika Schagatay. She found that Moken children see much better under water than European children, because they can constrict their pupils under water. Later she also found that any child can see well under water after training. You can read more here: National Geographic: Sea Gypsies of Asia Boast “Incredible” Underwater Vision. Orang Laut are living in western Indonesia and southern Thailand. They also used to live in Singapore but they where deported from the city when it started to grow. Orang Laut have historically been traders and fishermen, and they played a crucial role in the spice trade in the 15th and 16th centuries before European colonial powers changed the trade routes. Orang Laut have their own religion with animistic elements. Bajau Laut are the largest group of the sea nomads, and they are living in eastern Malaysia, southern Philippines, over big parts of central Indonesia and in Brunei. You can still find boat nomads in all countries and they make a living mostly from fishing (spear-, net- and hook-fishing). Their history is very much similar to the the history of Orang Laut, even if they are not related to each other linguistically. Bajau Laut were also deeply involved in the spice trade and they controlled the eastern routes. The Sama-Bajau group is recognized as one of the Muslim tribes of Southeast Asia, but many sea-dwelling Bajau hold on to their traditional beliefs. The animistic aspects of Bajau Laut are similar to those of Orang Laut – with offerings of rice and coconuts in order to appease the spirits. Blust, Robert A. (2007) The linguistic position of Sama-Bajaw, Studies in Philippine languages and cultures volume 15: 73-114. Sather, Clifford (2007); Sea Nomads and Rainforest Hunter-Gatherers: Foraging Adaptations in the Indo-Malaysian Archipelago, in Bellwood, P., Fox, J. J., Tryon, D (ed.) The Austronesians: Historical and Comparative Perspectives.Canberra: ANU E Press. 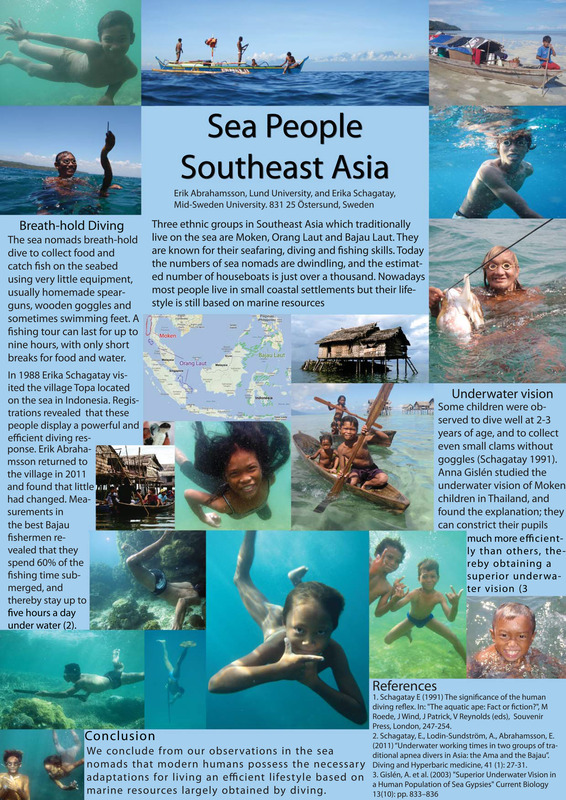 Abrahamsson, E and Schagatay E. (2013-05-09) Sea People – Southeast Asia.